Every hard surface, one wipe. For when you need to clean in a hurry, just grab a wipe and go. Pledge Multisurface Wipes remove three times more dust and messes than a dry cloth and will reveal the natural beauty of your hard surfaces* in each swipe. While tough on messes, the wipes are gentle for the surfaces and can be safely used on most of hard surfaces from kitchen countertops to stainless steel fridges to wood coffee tables. *Safe to use only on finished, sealed surfaces. Instructions: TO OPEN RESEALABLE POUCH: Open pouch by peeling back seal. Use wipes as directed. Reseal pouch after each use to preserve moisture. To maintain maximum wipe moistness, store pouch on its edge. Store at temperatures between 50° and 90°F. Storage at extreme temperatures may limit product performance. USAGE DIRECTIONS: To clean and polish your furniture, PRESS WIPE LIGHTLY, gradually increasing pressure as you go. Start with larger pieces of furniture first, moving towards smaller pieces last. As wipe becomes soiled, refold. Dispose of wipe when finished by throwing used wipe in the trash. Do not flush. Do not use for personal hygiene or as a baby wipe. DO NOT USE ON FLOORS! THIS FORMULA IS NOT SOLD TO ANY RETAILER AS A STORE BRAND. HELPFUL HINTS FOR USE: If surface looks cloudy or smeary, repeat procedure in "Usage Directions" . When using on old or unknown furniture finishes, test Pledge Wipes in an inconspicuous area first. Do not put partially soiled wipes back in this pouch with the new wipes. I love the fact that these are multi-surface wipes as I can use them on my butcher block counters, my wood table, my mirrors and leather couches. This product saves me money as previously I purchased specific wipes for specific surfaces... Thanks Pledge!!! Sometimes I just don't feel like dealing with the furniture polish. These dust wipes are great when you want to do some fast dusting before company arrives or when you have to do heavy-duty dusting. These are a regular essential for my dusting routines. Use these on wood jewelry boxes, etc.. Jet.com has these at a much better price than my local stores and it's not even always easy to find them in store. Hey Carol! Here at Jet, we want to ensure we're providing our customers with a wide variety of brands and essentials all in one convenient place. 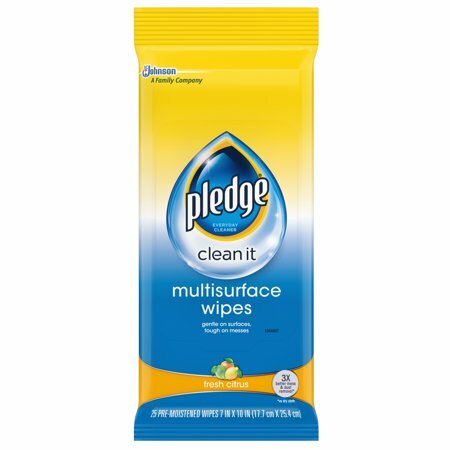 Thanks for taking the time to review the Lemon Pledge Multi Surface Wet Wipes! Will not damage your surfaces, glass,wood,etc. Can I use like a swiffer wipe on hardwood floors? 1. Yes, this can be used on hardwood floors.